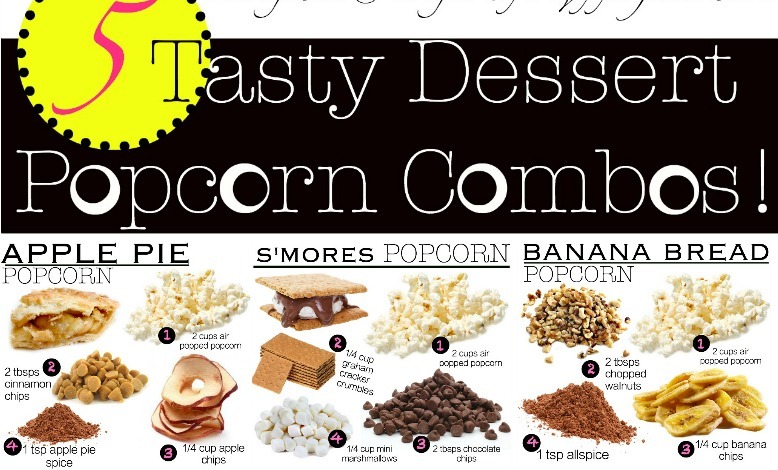 5 Tasty Dessert Popcorn Combos: Lighten Up Your Life! Air popped popcorn is one of my favorite snacks. It’s perfect for the days where you feel like eating the entire house for no reason. It has health benefits and is low in fat, calories, and sugar. I also love how diverse popcorn is. You can customize it to anything you’re craving. Popcorn is so boring by itself and it’s necessary to dress it up. 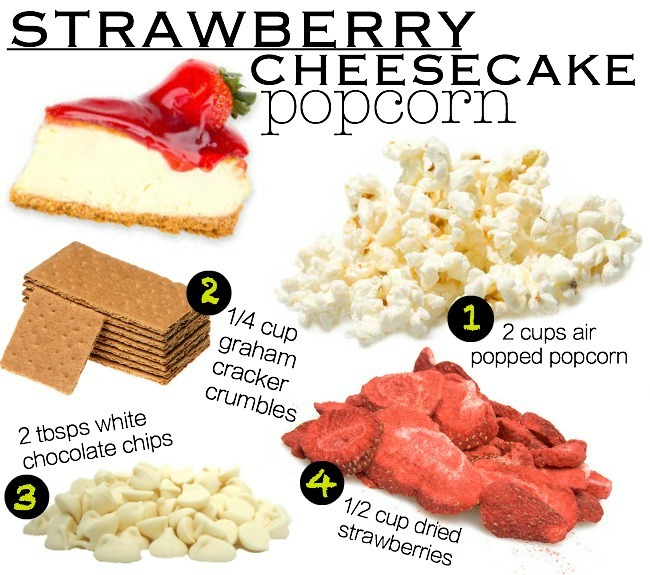 I wanted to share some of my favorite popcorn dessert combos. I’ll share the savory ones next time. I’m not a huge fan of cheesecake, but I love cheesecake flavored food. I’m more of a strawberry shortcake kind of gal. But, when I need my fix, I just dress up my popcorn. It’s much healthier than grabbing a slice of cheesecake. 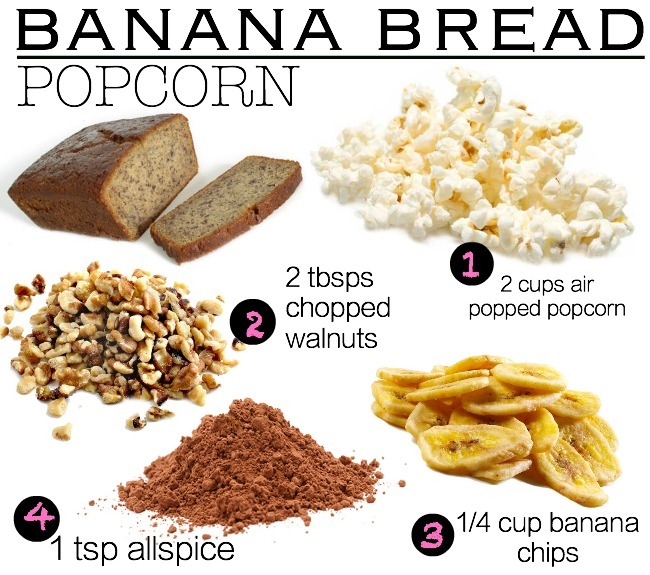 Banana bread is one of my favorite foods. I currently have bananas getting extra brown for the loaf I’m going to make later. I recently tried out this recipe for banana bread and fell in love. -sometimes I add dark chocolate chips. Who doesn’t love s’mores? Sometimes, when I’m craving a s’more I melt chocolate chips and marshmallows on a graham cracker in the microwave. The problem with that is stopping at just one. I like popcorn because it takes longer to eat and it fills me up more. Now, this one is my all time favorite. It’s actually funny because I’m allergic to cinnamon when it touches my skin, but I can still eat it. I have to be very careful when I’m working with cinnamon otherwise my face blows up like a balloon. Okay, that wasn’t funny at all. I love love love cinnamon rolls, especially this recipe right here! This recipe will make your fingers sticky, but that’s the beauty of soap and water. If you haven’t noticed already, I am also a huge apple pie fan. I have my grandpa to thank for that. 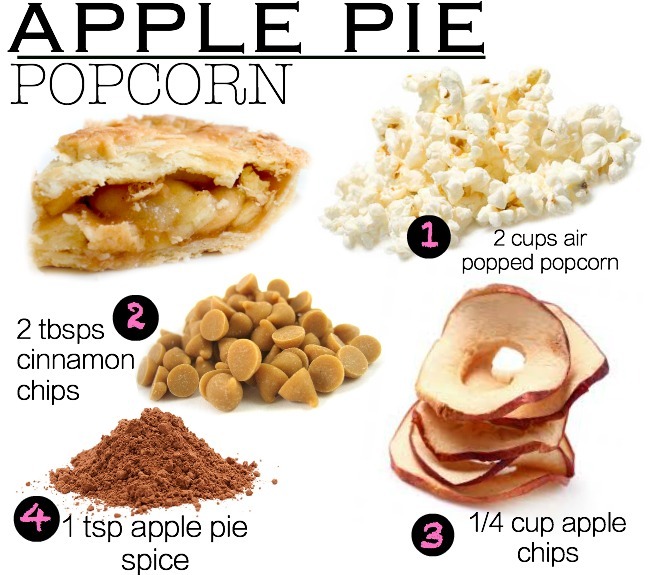 I love apple pie oatmeal, apple pie muffins, and apple pie popcorn! What is your favorite popcorn combo? Hey! How do you make those awesome infographics. I love the pictures of the ingredients, but I can’t quite figure out how you did it. Love these recipes too! How do you get the large pieces (choc chips, teddy grams) to mix into the popcorn instead of falling to the bottom? Taralynn, maybe I’m a dunce, but how do you MAKE the popcorn? 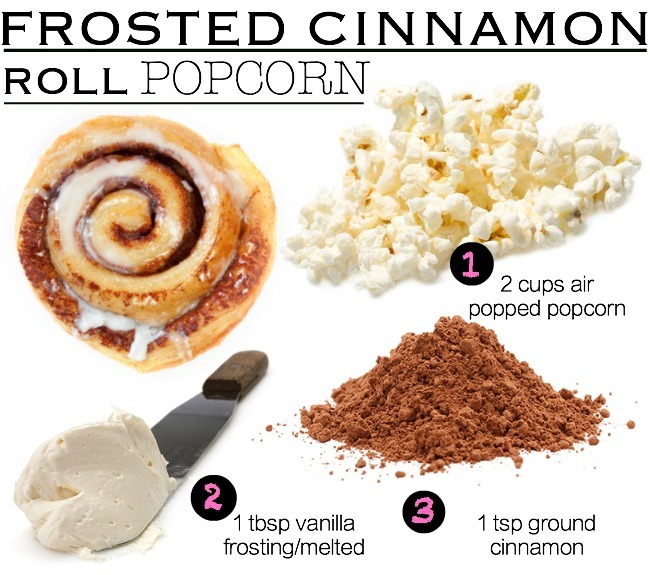 Heat the ingredients over it or just toss them in once the popcorn is finished? I’m a dork. Woah! This is awesome. I can’t believe I’ve never thought of this. 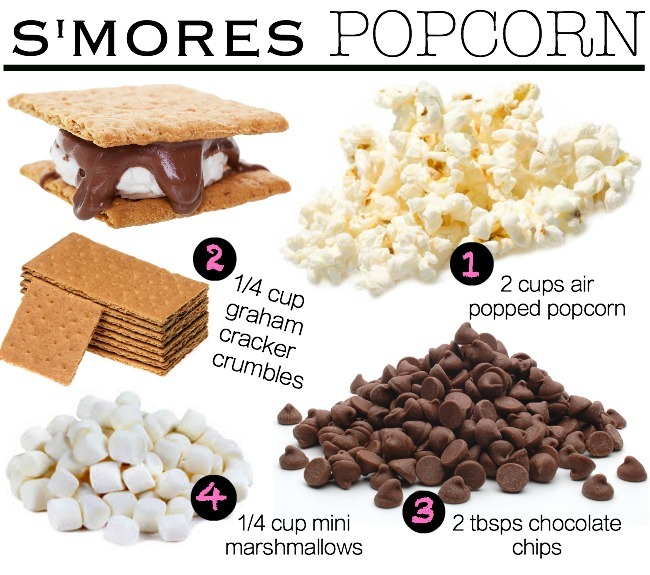 Definitely trying the Smores popcorn! It’s taken me a while to realise that popcorn is this good. Going to try the strawberry cheesecake recipe! This is such a great idea! I have been following your blog forever and I am just so happy that you are happy! This may be your best post ever! Can’t wait to try some of these! You are seriously a genius! Thanks so much for sharing!! I love popcorn so much, can’t wait to try these fun recipes! I don’t understand 🙁 how can popcorn have Health benefits? But more importantly, how do you eat these? do you just mix the ingredients? Do you chop it, melt it or what? As if I needed any more excuses to eat popcorn 😉 These all look SO good! These look amazing! I can’t even choose a favorite. You betcha I’ll be trying these out shortly! Thanks for sharing such healthy alternates to these amazing recipes.